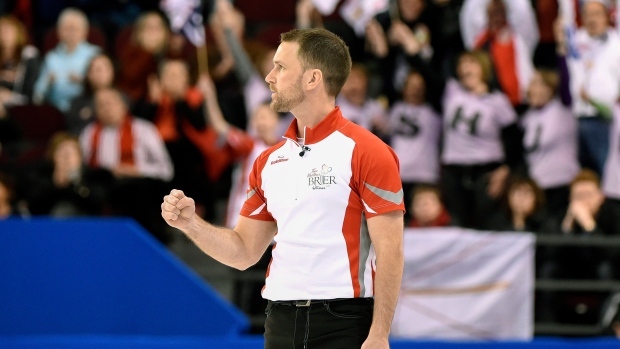 OTTAWA - Parity was the hot buzzword entering this year's edition of the Tim Hortons Brier. Nothing has changed now that the playoffs are here. The 12-team round-robin featured one of the deepest fields in the history of the national men's curling championship. There was no surprise at the four teams that made it to the final weekend. Newfoundland and Labrador's Brad Gushue, Alberta's Kevin Koe and Manitoba's Mike McEwen own the top three spots in the Canadian men's rankings. Northern Ontario's Brad Jacobs is ranked seventh. He's also the reigning Olympic champion and was unbeaten through the round robin. Gushue moved into the driver's seat Friday night but it's still anyone's guess who will hoist the Brier Tankard. The veteran skip needed an extra end to complete a 7-6 win over Jacobs in the Page Playoff 1-2 game. "We're one win away," Gushue said. "That was a heck of a game and a heck of a win." Gushue advanced to Sunday's championship game while Jacobs will play in the semifinal on Saturday night. Jacobs opened with a deuce and gave up a single in the third end. Gushue missed a tapback in the fifth and Northern Ontario took advantage with two points to lead 4-1. The Jacobs rink made a number of uncharacteristic errors in the second half of the game and it proved costly. Gushue scored a pair in the sixth end and moved ahead on a steal of two in the seventh. "They got some rocks in some good spots and we didn't," Jacobs said. "We had a really terrible seventh end. I think (coach) Caleb (Flaxey) said that was our worst end of the Brier. "So when that happens, something bad is bound to happen. We all took our turns that end unfortunately." Jacobs even flashed a stone in the eighth before connecting on a takeout to tie the game. The teams exchanged singles before Gushue hit a nice tapback in the 11th end for the victory. Newfoundland and Labrador shot 92 per cent overall while Northern Ontario was at 87 per cent. McEwen and Koe will meet in the Page Playoff 3-4 game on Saturday afternoon. The winner advances to the semifinal that night against Jacobs. The semifinal winner will play Gushue for the title. Earlier in the day, Northern Ontario closed out a perfect round-robin with a 4-1 victory over Gushue. Jacobs won all 11 round-robin games and had choice of stones and hammer for the evening rematch. Gushue finished 9-2 while Koe and McEwen were 8-3, with Koe taking the third seed thanks to his win over McEwen earlier in the week. The semifinal loser will meet the 3-4 loser for the bronze medal on Sunday afternoon before the final. Gushue won Olympic gold at the Turin Games in 2006 but is still looking for his first Brier title. He's making his 13th career appearance at this event. Jacobs won a national title in 2013 and took the Olympic crown the following year at the Sochi Games. Koe has claimed two Brier titles and won a world championship in 2010. McEwen has been a force on the curling tour over the last few seasons but had a hard time getting out of the Manitoba playdowns until this year. He closed out his round-robin schedule with an 8-3 win over Prince Edward Island's Adam Casey. Jamie Koe of the Northwest Territories held off Quebec's Jean-Michel Menard 8-6 and B.C. 's Jim Cotter beat New Brunswick's Mike Kennedy 7-5. Team Canada's Pat Simmons missed the playoff cut at 6-5. He beat Jacobs in last year's final in Calgary. Saskatchewan's Steve Laycock was 5-6, followed by Menard and Ontario's Glenn Howard at 4-7. Jamie Koe was tied with Kennedy and Cotter at 3-8 and Casey finished last in the 12-team field at 2-9. As a result, P.E.I. is relegated to the qualification pool at next year's Brier in St. John's. The provincial champion will have to compete in a four-team round-robin with Nunavut, Nova Scotia and Yukon for the single berth in the main draw. Announced attendance was 6,759 on Friday morning, a significant uptick after middling numbers through most of the week. The 8,200-seat venue was less than half-full for most draws after a decent opening weekend. A near-sellout of 7,722 took in the 1-2 game Friday night. Alberta's Chelsea Carey won the Scotties Tournament of Hearts last month in Grande Prairie, Alta. She will represent Canada at the upcoming women's world curling championship in Swift Current, Sask.